The plan is for us to head to a small crappie pond tonight and try out the new Hydro Glow Fish Light. We’ll keep you posted on the outcome! See you Soon. We tried out the light last night. WOW! ;D That thing really glows. The fishing on the other hand sucked. We marked a lot of fish working the edges of the glow but they were strange. In 22fow, the fish suspended about 16-18 down, charge the bait, get 6 inches from it, stop, turn and charge the bottom, weird. 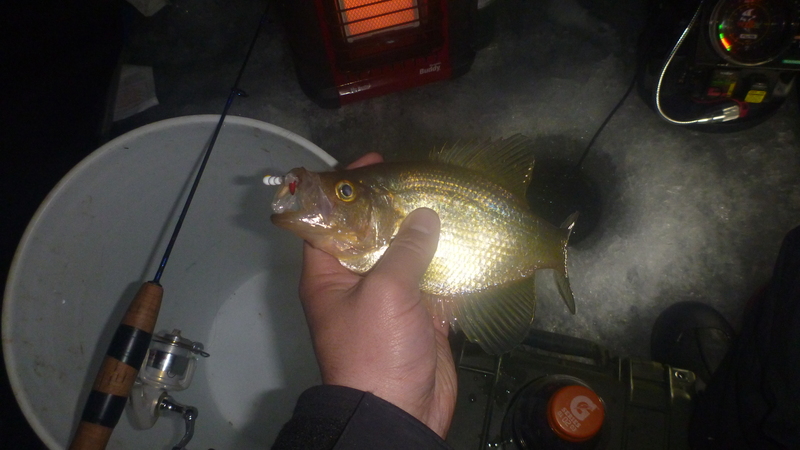 We managed to get a few crappie and perch but nothing to write home about. I am convinced that the light is productive, just don’t stare at it too long like me, you’ll see everything in red for a couple of minutes! Previous Post1-29-12 – Champlain Trip Part IINext Post1-31-12 – Champlain Again!! !